Once again this is about my Sims 3 Legacy family. Bonnie's and the Grim Reaper's first child, Veronica, turned out with normal skin color. Not the jet-black skin I wanted. The Grim Reaper, obviously not happy about it and not attuned with the idea of being a father yet, attempted to sacrifice his first born in fire. 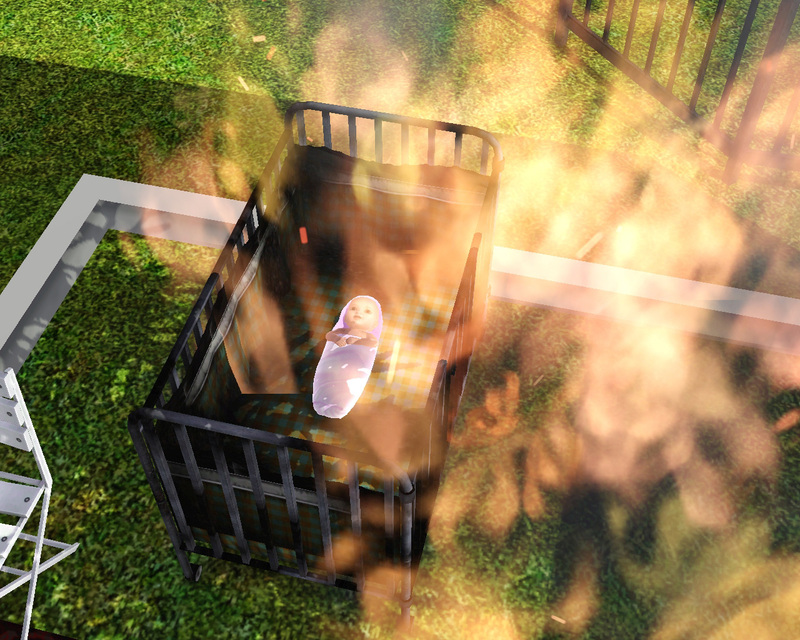 However, babies in the Sims have an uncanny immortality. The crib Veronica was in burned, yet she was untouched. Next, the Grim Reaper attempted to abandon her by some old dumpsters behind the Outstanding Citizen Warehouse Corp. building. Eventually, Child Protection Services got wind of this mistreatment and took Veronica away to live in a different household. Meanwhile, Elvira was born. Also regular skin color. This time Bonnie convinced the Grim Reaper to keep her. Fair skin or not, the legacy must continue. The Grim Reaper, however, wanted to finish what he started with Veronica. When she turned to a child he tracked Veronica down and invited her over. He already had a deathtrap planned for her; and she fell right into it. Children as not as fireproof as babies. The Grim Reaper finally succeed at sacrificing his firstborn in fire. Perhaps the Sim Gods are as perverse as the Grim Reaper himself. For right after the sacrifice, triplets were born. Finally the Grim Reaper had his jet-black skinned daughter, Annabel Lee. He's been taking special care of her since her birth. The other two are named Sabrina and Sidha (pronounced "shee" or "SHEE yeh"). Surprisingly, the Grim Reaper does not have the Evil trait, despite his behavior and occupation (Emperor of Evil). He does have the Inappropriate and Insane traits, though. Oh wow, I didn't know the Grim Reaper was so violent! @ Vid: Heh. Well, you know how the Sims are. I keep the free will setting on, but they're still under my control. They do as I say. So how many of these posts been free will and how many have been what you told the sims to do? Like... Did you make Bonnie go up to Grim when she was little, or was that free will? @ S1x Legi0ns: I'm a micromanager. Most of what my sims do is because I've told them to. Random events happen like that death, but I told little Bonnie to talk to the Grim Reaper. I'm playing a game, not watching a movie. Games are interactive.